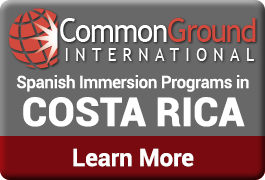 Study Spanish easily with a convenient and complete Spanish grammar reference at your fingertips. Now you have all the power for learning spanish verbs and grammar. 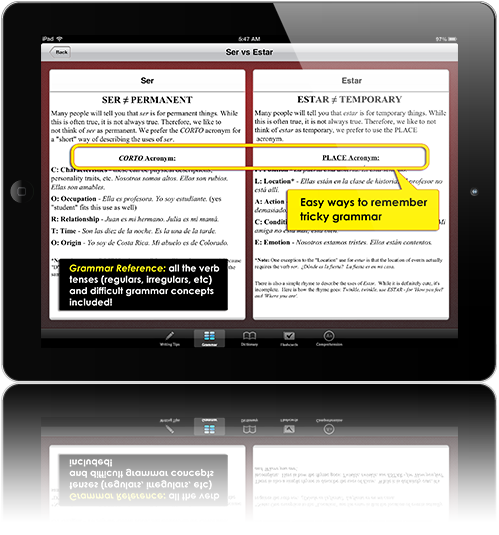 In this app you will find catchy mnemonics and songs for learning Spanish, remembering tricky Spanish grammar, helpful sample phrases that clearly demonstrate how the grammar is supposed to be used, and all the Spanish verb conjugations you need to manage. In addition to clearly outlined verb conjugations for regular and irregular verbs in all tenses, we have also included some fun songs to help you remember the irregular verb conjugations! Advanced Spanish grammar gets difficult the more you study – that is unavoidable, but you’ll be surprised at how simple it can be if it’s just presented in the right way! Tricky topics are broken into plain language for you with plenty of examples to guide you through what you’re trying to study. 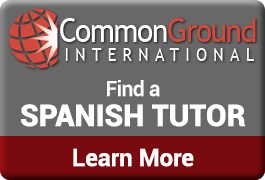 Spanish grammar is the glue that holds speaking Spanish together and guides you as you try to learn Spanish. The grammar reference alone in this Spanish app makes it worth while to purchase. Get your copy of High School Spanish today!